Easter Sunday is the day Christians celebrate the resurrection of Jesus Christ from the dead. The season of Easter lasts for 50 days (7 Sundays) until we reach Pentecost when the coming of the Holy Spirit is celebrated. During this season, John's Gospel is read, alongside stories of the early church from the book of Acts. The colours of Easter are WHITE and GOLD. 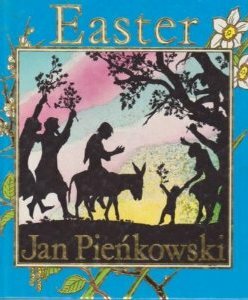 Jan Pienkowski's book Easter tells the story from Luke's Gospel in the King James version of the Bible. It's beautifully illustrated in his distinctive silhouette style and is available to read on-line. Just click the link on the right.